Claire Denis speaks in her own inimitable cinematic language, one as piercingly intelligent as it is poetic. Her collaboration with Isabelle Huppert as a coffee plantation proprietor in the war-torn African countryside is perfect - they are so attuned to the same fragile, singular wavelength that it's hard to believe that they've never before collaborated. As always, everything in Denis' latest is technically exemplary: no film made in 2009 features better editing, cinematography or sound design - and, for certain, no film features a more harmonious confluence of those technical facets. But it would also be wrong to reduce it to the sum of its aesthetic brilliance: beautiful without being ostentatious, shocking without being puerile or provocative, mysterious without being obscure, intelligent without being didactic, poetic without being precious, emotional without being sentimental, political without being polemical, it would be hard to imagine what more I could ask for from a film. I would say "a sense of humor," but after years of watching her work, I would suggest that she has a dark sense of the absurd that it's possible to find pretty goddamned funny provided it hasn't caused you to recoil completely in horror. For instance, in one moment in White Material, the slothful son floats idly in the coffee plantation's concrete pool despite the indications that the world around him will be soon collapsing. An arrow, from out of nowhere, ineffectually hits the water beside him. He pops out of the pool to catch a glimpse of his unavailing assailants: two young black boys, who immediately disappear into the wilderness surrounding the pool. On the one hand, the scene is terrifying: an unsuspecting victim suddenly attacked by two inscrutable aggressors, aggressors made all the more threatening by the spectre of anarchy's eminent impending descent. On the other hand, everything about the scene is a touch goofy. The youth of the assailants, the slovenly character of their target, the harmlessness of the arrow, the incongruity of the pool in the desolate landscape. As horrifying as I found the scene, there's still something about it that I find funny. Even Huppert's intense confrontation with the impromptu toll collectors has an almost Fawlty Towers-ish element of comic discomfort, a "Yikes, no!" as you look through your fingers and then a laugh of relief when the situation defuses. Of course, with Denis it is always impossible to guess which situations will defuse and which will explode. So much of the difficulty in predicting the films of Denis comes from her frequently discomfiting sense of empathy. From the very beginning, her films have delivered the audience through the vicarious experiences of some deeply unsympathetic characters. Denis never shies from the intellectual exercise of deeply identifying with normally detestable folks like serial killers (I Can't Sleep), fascistic military officers (Beau Travail), kidnappers (Nenette and Boni), self-absorbed vampires (Trouble Every Day) and Vincent Gallo (Trouble Every Day) in order to a induce a revelatory experience of reality. In White Material, her odd relationship to the vicious child soldiers contorts the audience's sense of film into some very strange positions. At Toronto Film Festival this year, everyone asked me what I thought of the controversial ending - but I didn't even understand what they were talking about: I was most baffled by the poetic title card that concludes the film and seems to wish the surviving child soldiers well on their indiscriminate rampage of murder and mayhem. For the record, as proved by the questions about "the controversial ending," there are parts of this film even more troubling than that. But the value of Claire Denis' cinema can found in that exact impulse to anti-morality: unencumbered by the desire to tell her audience how to think and what to feel she pursues thoughts and feelings, the limits of our senses, to an almost other-worldly understanding of reality. She pursues an "ecstatic truth" that few artists even have an inkling of existing. She pursues unimagined landscapes and new ways of seeing. White Material avoids exactly the falsehoods and idiocies, the easy pieties and numbed senses of run-of-the-mill art because Claire Denis scarcely even glances at reality from the same perspective as those run-of-the-mill artists. Over and over, it has been written that Michael Haneke's new film explores the roots of Fascism in a small German village by presenting the generation of wicked children that grew up to be part of the Nazis movement. But that's not exactly correct: Haneke is not necessarily interested in exploring the roots of fascism, but in asking the question of why German culture didn't prevent the rise of the Nazis from happening. The deeply disturbing notion driving Haneke's film is that German culture was the apex of the Civilized Western Sensibility that prizes education, religion, community, music and morality above all other things. And none of these cultural virtues were able to impede the mass scale horrors that followed. In Germany, not only it was not an absence of these things that led to the Holocaust, WWIII and Nazism, Haneke further explores how the virtues don't even appear to have been significantly debased: it is not thatthe Germans lacked education or a tightly-knit sense of community or Protestant work ethic or a strong moral anchor to the community or a casual familiarity with finer things like music and art; all these bulwarks were in place and had no effect against the tide of horrors that began as a trickle and then flowed freely in the coming decades. The same children that wore the white ribbon to be reminded of their innocence served in the S.S. and cheered at book burning rallies. What can save us from future holocaust, if not those very things which failed in the first place? It's a terrifying, deeply upsetting thought and Haneke wants to remind us that the characters in his film are not simple hypocrites who smilingly parrot religious phrases and empty platitudes while knowingly harboring wicked intentions: putting the following years in perspective, within the world of the film it is impossible to pin-point who should be held responsibility for the creeping violence infecting the community. The town's children are almost certainly responsible, but shouldn't its educators, clergymen, intellectuals, parents and businessmen be able to stem the spread of diseased minds? Isn't that exactly the responsibility that they have all explicitly taken up for themselves? And how, exactly, was it that they failed in thes responsibilities - it is entirely unapparent. The White Ribbon is a black and white film totally lacking in them. 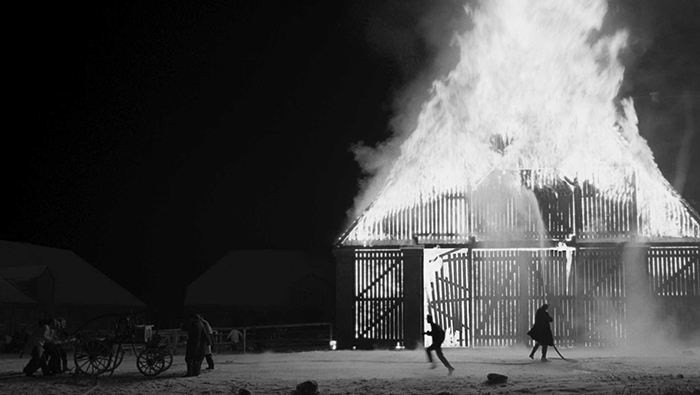 Beyond the ideas, The White Ribbon happens to a typically hypnotic and powerful aesthetic experience: if Haneke is not a master of cinema, then cinema cannot be mastered. His framings are precise and evocative, but rarely showy - his long-standing aversion to empty spectacle means that every piece of his puzzle is carefully placed and functional: it would be inaccurate to describe this film as bravura or tour-de-force even though The White Ribbon at level of technical and visual accomplishment well beyond most films described in that manner. Haneke has accomplished an appropriate visual style in which to situate is moral ironies: a gorgeous film that never luxuriates in cheap, show-y aestheticism. The choice of B&W photography could be an example of artistic short-cutting for which Jean-Luc Godard famously criticized Schindler's List, but a world drained of color feels essential, not like a pseudo-documentary shtick. The running criticism of Haneke threads around the word "contempt." Contempt for his audience or contempt for his characters or contempt for society or art or even cinema. The White Ribbon has predictably drawn similar charges and, once again, folks have questioned the source and reason for Haneke's contempt. If people feel that asking hard questions with passionate and clarity, without providing answers and putting the monsters back in the box, if people feel this constitutes "contempt" then few of the greatest artists in history have not been deeply contemptuous. The film is ultimately a shattering experience, one that thoughtfully pulls apart our society's most deeply held beliefs, even the most deeply held beliefs of a cynical intellectual know-it-all such as myself. After The White Ribbon, only a fool wouldn't be able to see that Haneke's contempt is justified. The Headless Woman, brilliant and unforgettable, manages to pull off the rare feat of being oblique, self-conscious and arty while being narratively gripping and emotionally forceful. Lucrecia Martel and Claire Denis have proven themselves two of le cinema's premier talents so feminist bloggers can relax (or, sadly, keep talking up hacks who happen to be women like Nancy Meyers and Kathryn Bigelow). Seriously, though, Martel's talents as a pure cinematic virtuoso easily rival anyone out there: her aggressive widescreen close-ups and circular, psychotic story-telling are not only original and unmistakable (unmistakable for their originality), but technically precise and dreamily evocative. Her compositions, both narrative and framing, are inimitable - or rather, imitations would be indubitably recognizable as cheap knock-offs of the real deal. Her continued progression to bona fide genius knocks me out of the boo-hoo-itude running throughout the rest of this year in reveiw - this film, one of the year's most singular strangely and beautiful, was a genuinely invigorating bright spot amongst 2009's otherwise enervating debris. However, to complement only the oneiric style of the film would be underselling the intelligience of the artwork: it also happens to a brilliant essay on "lucidity" - the narrative ellisons and aggressively off-kilter framings aren't empty aesthetics choices, but excogitations on the theme. Perception, memory and interpretation are tenuous, malleable sensations, so ephermeral that any clarity about reality seems also impossible - but make no mistake, this isn't any sophmoric "there's no such thing as objective reality" rant; there is definitely an objective reality and that objective reality is urgent: did our heroine run over a child or not? The answer isn't idle and the truth definitely has meaning - not only (obviously) for the boy, but for the blonde-turned-brunette heroine Vero who can hardly decide how guilt-racked to be. After the accident, she is a woman losing her mind, but by Martel's account minds are always on the verge of losing themselves. The problem of existence is reconciling unstable elements such as thought and memory to form a solid picture of reality or something like concrete beliefs. The great mystery of the film is whether Vero suffers from self-deception or delusional guilt: viewed from outside, it's all but impossible to determine the answer. One can only imagine how impossible the problem is viewed from inside Vero's own head. And, maybe most impressively, what could easily be an antiseptic exercise in style and philosophy (think Last Year at Marienbad)* ends up being a strangely emotional experience: an eerie tone unexpectedly punctured by bursts of over-whelming sadness or passion or despair. Martel plays the almost tactile quality of her images off of the numbness of her heroine: as the insensibility of Vero subsides, unpredictable emotions rain down on the film in torrential sheets: an arid, dusty landscape suddenly flooded with harsh and unexpected elements. And the theme of "lucidity" constitutes only one facet of the film: Martel also finds strange and surprising intersections of recurring ideas like culpability, sickness and class division. Martel sets herself up with a wealth of material and really makes the most of it. She's the rare kind of genius that doesn't use obscurity to hide a lack of under-lying substance, but instead to shed light on the most dim, cryptic mysteries of existence: lucidity is, fortunately, perversely, her strong suit. * I don't mean antiseptic necessarily as an insult or any acceptable reason to casually dismiss Marienbad, just that it's the standard for this sort of mental puzzle film. File it under "The Most Predictable Ironies:" panicked executives made the purely financially motivated decision to cut in two Steven Soderbergh's expensive, contemplative, 4-hour biography of Marxist revolutionary Che Guevara, resulting in Che being (tentatively) repackaged as The Argentine and Guerilla. A philosophical compromise based purely on the profit margin in a film about one of history's most uncompromising anti-capitalist lunatics: gee, who would've seen that one coming? But don't be fooled; this is one movie and neither part taken on its own would have even a fraction of the impact of Che. Both ends of the political spectrum were perturbed by Soderbergh's almost complete de-politicizing of the notorious guerilla fighter's story: what's the point of telling his story if you don't address exactly what it was he was fighting for? But Soderbergh finds both an extremely satisfying narrative answer and a thematic answer to that question as well. First, the story of Che's successful guerilla campaign in Cuba and, its mirror, the failed campaign in Bolivia are fascinating as war stories: Soderbergh compiles a wealth of details about the exact process of waging guerilla warfare and manufactures a tense and engrossing plot that works mainly as a procedural. He parses the nitty-gritty (especially in the failed Bolivia campaign) and brings the audience along through the process in a way that surely must be fascinating even for the most hard-line, anti-Communist: the story of his accomplishments and failures works purely as a movie, with the takedown of Havana being as gripping an action sequence as anything in the equally de-politicized The Hurt Locker or the confused pseudo-Leftist Avatar. Or even better, a true conservative should relish the evocatively rendered details of Che's increasingly pathetic failures in Bolivia. Again, Soderbergh concentrates on the minutiae of the process; in Bolivia, it's a process of utter failure, incompetence even. That second part of the film has a slow-burning cumulative desperation to its narrative powered by the ghosts of the Cuba campaign. Without Cuba, the narrative would a lack primal immediacy: you might be able to understand his reasons for refusing to cut his loses and get the hell out of there, but you wouldn't feel them on a gut level. 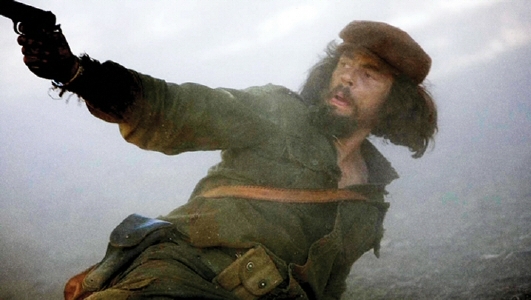 Second, Soderbergh chooses Che as the perfect expression of his anti-epigrammatic theme: history never repeats itself. The successes of Cuba create the illusion that such pastoral armed insurrection can (and should) be repeated the world over, from the Congo to Bolivia; the reality is that a very specific, almost mysterious confluence of events came together to foster the Cuban insurrection and attempting to recreate those events, to repeat history, is generally a losing endeavor. ** The Bolivia campaign is a series of painful mis-steps, each one motivated by the previous success of Che in Cuba. Soderbergh closely examines the Cuba campaign, seemingly compiling a field manual for successful guerilla warfare... and then turns around to demonstrate the almost hilarious impotency of Che applying those same concepts in another country almost a dozen years later. The sweaty, grimy procedural details of the Bolivia failure are narratively compelling on their own; in the thematic context set up by Soderbergh they become inconceivable. For Che, it is impossible to come to grips with the fact that history is not repeating, that the methods of a former success would lead so directly to failure. Of course, there are myriad differences between his strategies in Bolivia and Cuba, but that's exactly the point: nothing is the same as similar as the surfaces (and underlying intentions of history's actors) would appear. Che is a tough sell for sure, neither appealing to the subject's fervent detractors nor his fashionable enthusiasts (get it - they wear t-shirts! ), an interminable running time that intentionally sputters to an ending in which the main character is executed, a wildly variable cinematic talent taking on a touchy subject about which it would have been previously impossible to know he had any interest, advance word that inaccurately underplayed the gripping action and harrowing drama. Add in that it was a big fat target for anyone looking to take potshots about hypocrisy: so, big Hollywood stars spent millions of dollars to lionize and profit from the story of the all-time anti-Capitalist? I suppose it didn't afford anyone any comfort that Che really did end up being such a crashingly uncommercial project - no wonder vendors scattered and money-men scrambled to reassemble it. But, trust me, pal, this sweet baby sells itself: Hollywood's most unpredictable artist taking yet another chance and delivering the best film of his career. Take it out for a ride - I guarantee you'll be surprised at how it handles. Che is truly the Bentley of films. ** Incidentally, that's a deeply anti-Marxist idea, that economic philosophy being driven by the notion that History itself is pre-determined and revolution inevitable. Honestly, there's a hundred reasons that it baffles me that conservatives hated this movie. For instance, Jewish folks didn't hate Downfall and this film is essentially a Che-for-Hitler substitute on the same concept. For God's sake, the film ends with a "chickens coming home to roost" speech delivered by Che's principal captor.